Those who know me (and those who read my blog) know that I am never at a loss for words. A five-minute incident can easily turn into an one hour phone conversation and 1000 word blog – without a blink of an eye. And in my short thirty something years, I have had no trouble talking with anyone – celebrities included. Chatted with Beth Stern about children. Chatted with Mike Holmes about construction. I have even chatted with Robin Williams on the phone while donating relief during the Haiti telethon. It is safe to say, I am verbose. 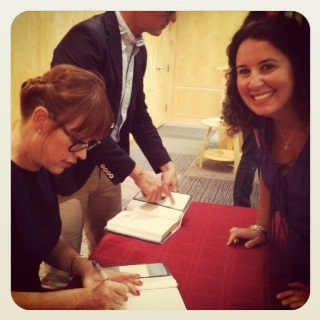 I recently had the privilege of attending Molly Ringwald’s book signing at the Princeton Public Library. She was elegant. She was intelligent. She was gracious. She was absolutely personable and approachable. I wish I could say the same for myself. See….I even look like a spaz in the photo! I turned into a total spaz the minute she took the podium. After reading an excerpt of her latest work, she eagerly took questions from the audience. My mind just went blank. As I approached the table, I seriously must have seemed like a total mute, dork, weirdo and everything in between. I could barely utter a word and when she asked my name I gave her the incorrect spelling of my name! My own name!!! Not sure what came over me, but I regret not having the brains to pull it together. As someone who always toys with the idea of writing a book, I had the perfect opportunity to ask an author what and how and why she sat down at her desk that day to begin to write the book. But instead I grinned and smiled and nodded my head. OMG you are posing with Molly Ringwald!!! Wild isn’t it! She really was so nice.